I would like to share a card that Suzanne Dean made with our Pilot Luka (with her permission of course!!). Isn't it just adorable??!! 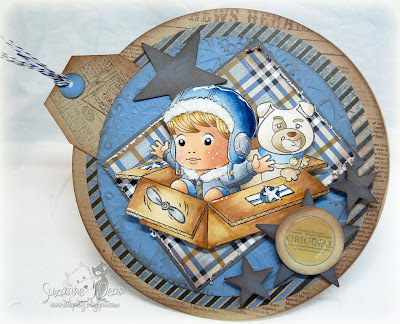 Today I get to share with you a very fun project I made last week--I had soooooo much fun with this and putting all the perfect details on it! This is for the 7 Kids Challenge Blog today which is to create a "Circle Card"--I love, love circle cards so this was easy peasy for me. The cutie pie image is called "Pilot Luka" by La La Land Stamps. 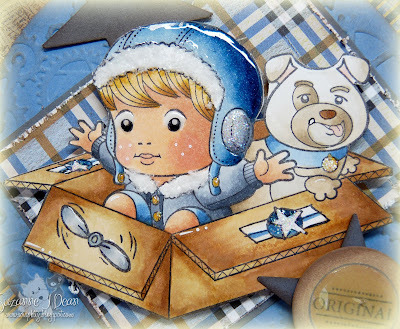 I adore this line of stamps and my friend Irina (and Eric) both illustrate these cuties. As soon as I saw this one at CHA I knew he'd be mine as he reminds me sooo very much of my son when he was younger although he STILL has a fascination with all things that fly, LOL! The papers are a mix by Basic Grey and then kraft cs that I stamped a newsprint stamp on by PTI. I distressed the edges with my fave Zutter Distress Machine & then inked all my edges with the Inkssentials Blending tool (love those two things sooo much)! The tag I created myself with various Tim Holtz stamps stamped on kraft cs and then clipped the edges, added some bakers twine to the end. 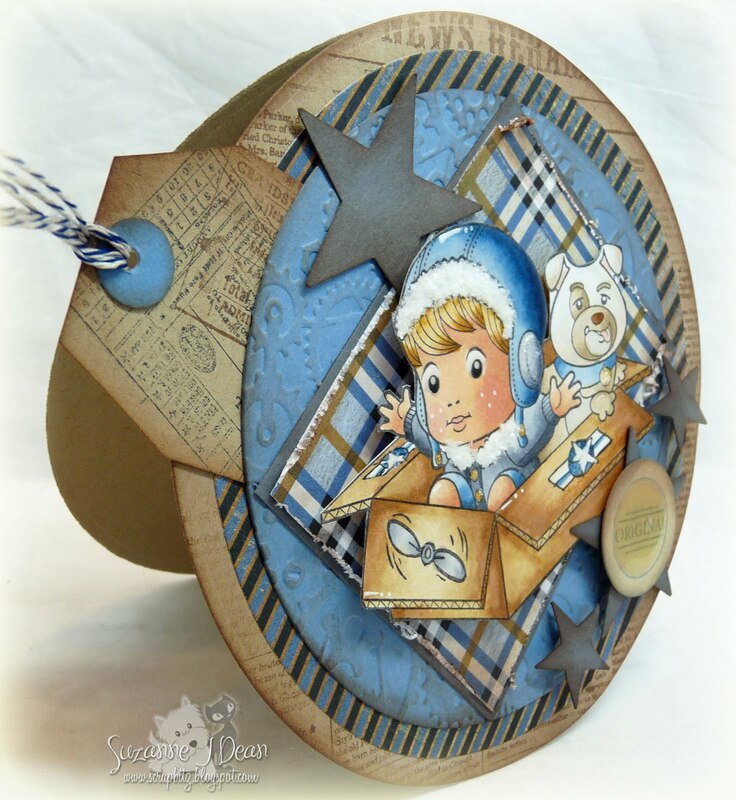 The blue cardstock was embossed with the CB Embossing folder "Clockworks" and inked it a bit as well. You know I'm a product junkie and the more I can add to my projects the better, LOL! I used Diamond Glaze on his helmet and eyes for a great shiny effect! His fur collar and fur trim on helmet got a coat of Polar White Flower Soft--I didn't use flock because I wanted it to look a little more textural than a soft flock. And of course some Stickles on the stars and dog collar charm :) He's colored up with Copics of course-- B99,B97,B95,B91/E39,E37,E35,E31,E50/YR23,YR20,E50/E11,E00,R20/C7,C5,C3,C1,C00/E43,E42,E40. Thank you SO MUCH Suzanne for creating such an AWESOME project and for letting us share it too! !